A weekend spent camping in the mountains confirmed that I am too much of a city junkie to ever truly enjoy being outdoors. We stopped on our way back to LA to snap these photos. I think I get more excited about the stops along the way than the actual destination itself during road trips. I'm a sucker for exploring ghost towns and scenery that lures you by serving as a perfect backdrop for a shot. 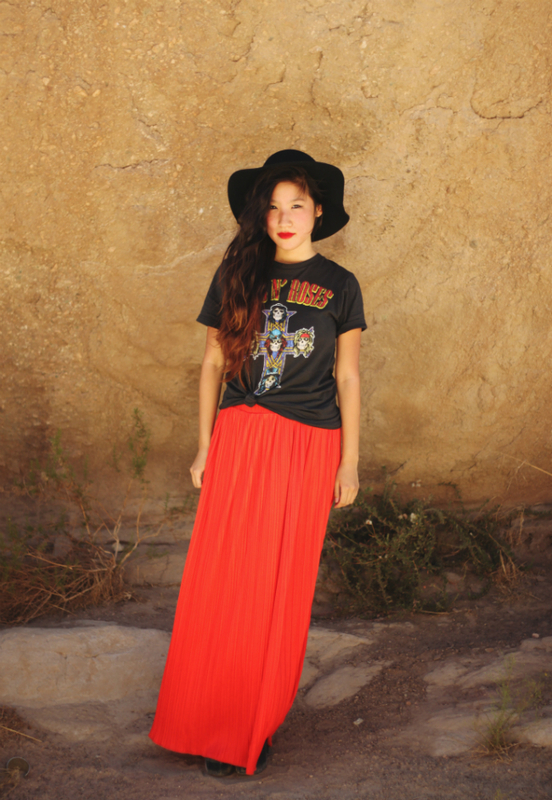 A tee and a maxi skirt never gets tiring, especially when the flowy pleats are a fun poppin blood orange. Come back on Wednesday for a giveaway by Native Runaway! Everytime I go on a trip, I too always look at a place and see if it'll be a great backdrop for photos! LOL :) Blogger life. These shots are gorgeous! 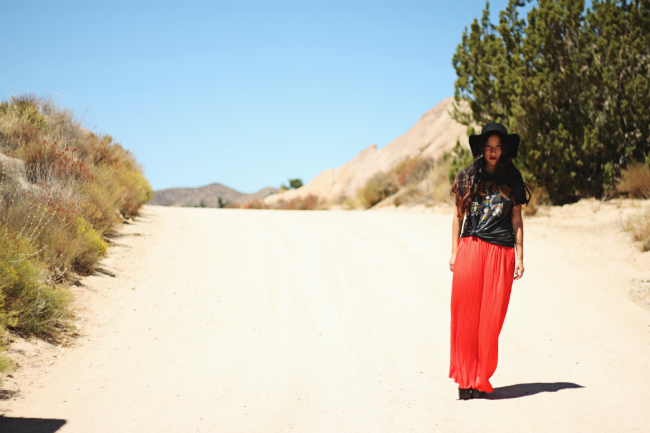 Love the vibrant maxi skirt! I like the cool & edgy look! and may I say...AMAZING PHOTOGRAPHY! I love this look! totally something I would wear. The shirt, the hat, the skirt! These are some pretty sweet shots. Love how the color of the skirt really pops. Can't wait for our blogger meetup in NY! When do you arrive? amazing outfit! you look so amazing! Love the skirt, the colour is pretty! This looks absolutely awesome and stunning; the outfit, the photos, the setting... WOW! re: it's in Melbourne, St. Kilda. do you live in Aus too? Great scenery and beautiful look! The skirt is gorgeous. 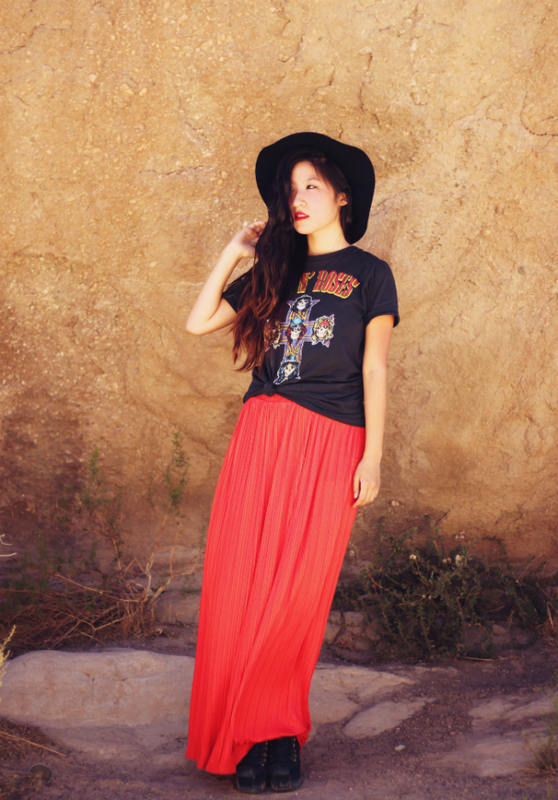 It's true a maxi skirt and a t-shirt are always a perfect outfit, and this one is no exception, you look great! Really liked your style and your blog. You look gorgeous! great skirt! haha. I always look for a good backdrop too when I'm looking out the window in the car. OMG this outfit is awesome. I love the skirt, the guns & roses tee, and the hat is fab.